The 'patch' was still really good for waders today, although there has been quite a change over in birds. Today there were ten Green Sandpiper, eleven Ruff, seven Marsh Sandpiper, one Terek Sandpiper, one Ruddy Turnstone, one Common Sandpiper, one Common Greenshank, four Common Redshank, one Common Ringed Plover and a scattering of Little Stint, Wood Sandpiper, Little Ringed Plover and Kentish Plover. 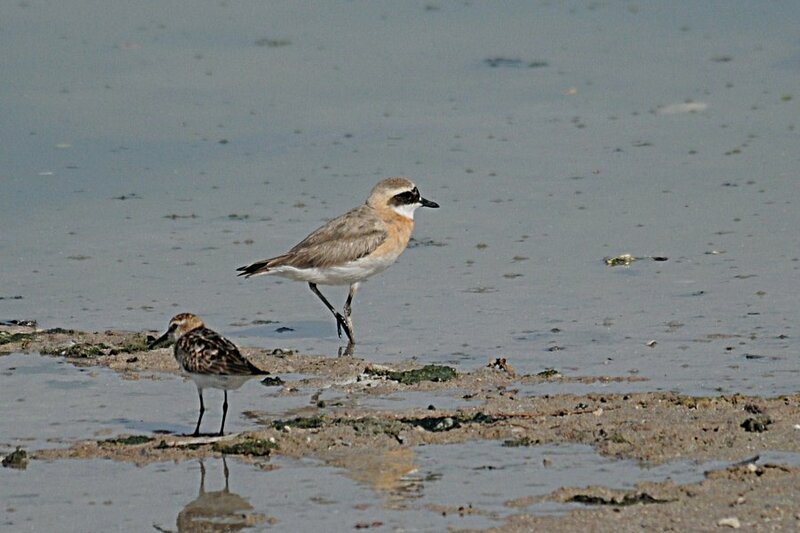 The best bird was a partial summer plumaged Lesser Sand Plover which was a new 'patch' species for me and an unusual bird inland in Saudi Arabia. The photograph attached here is not the bird I saw but one taken on the shoreline at Dammam - Al Khobar Wader Roost a few days ago but is in similar plumage to the one I saw today. There were approximately five hundred waders on the pond today which is a really high count for a small inland pond. Other good birds today included two Northern Shoveller (the same tow as yesterday), one Little Egret a juvenile white morph Indian Reef Heron and five Cattle Egrett which are the first returning birds for the winter.